A major cruise ship terminal for West Cumbria that could be the calling point for 25 ships a year is set to be built in Barrow. A study by cruise specialists favoured the town over Workington, partly because of facilities already in place. Cumbria Tourist Board said a terminal would boost the business and tourism status of Barrow and the whole county. Between £7m and £10m will now be sought for the deepwater facility on the Walney Channel to host the ships. The tourist board's director of cruise development Terry Toohey said: "Barrow is going to be the area to get the facility but the whole of Cumbria benefits. "As more vessels come into the area, Workington may well be the access point to the northern Lakes area." 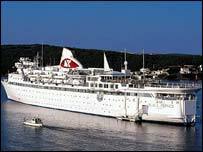 It is hoped that by 2015 up to 25 cruise ships each year would visit Barrow. Mr Toohey said that while many cruise passengers go off into the region, a fair number of passengers and crew remain close to the ship and studies show that crew spending is getting close to passenger levels. He said: "Many passengers also return at a later date for a land-based holiday and Barrow and the region will benefit from that. "The recommendation has been taken up by Cumbria cruise steering group and will now be put forward to the West Lakes Renaissance for possible inclusion in its business plan and we would like to think we will get the go ahead from them."